As mentioned in an earlier post, we were fortunate enough to be sent some great books to review last week. 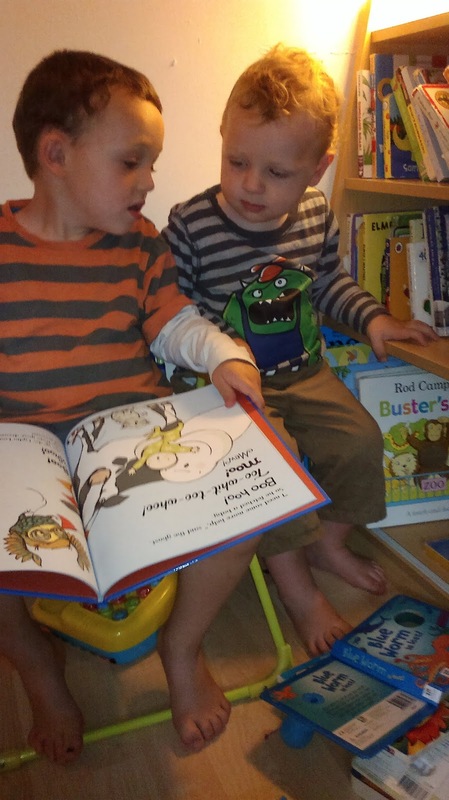 The previous post dealt with the books for Toby's age range (although both boys are thoroughly enjoying them). This post focuses on Ollie's books - 'Wake Up Do, Lydia Lou' by Julia Donaldson and Karen George, and 'Little Mouse's Big Book of Beasts' by Emily Gravett. Ollie, as with most small folk, is a creature of habit. He likes a straight forward A to B narrative, with lots of cosy rhyming and bright, easy to interpret imagery. 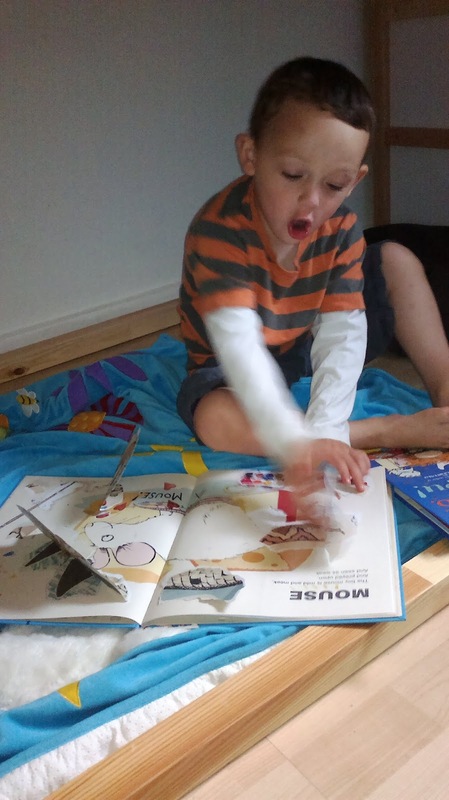 I suspect this is why children in his age range all adore modern classics such as the series of books by Julia Donaldson and Axel Scheffler, including 'The Gruffalo' and 'The Smartest Giant in Town'. Knowing how much Ollie has enjoyed these in the past, I was really interested to receive another Julia Donaldson book, the result of a different collaboration, this time with talented new illustrator Karen George (winner of Waterstone's Picture This Competition). 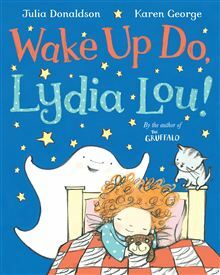 Wake Up Do Lydia Lou has all of the rhyming charm and build up of characters and noises familiar to readers of Donaldson's previous works, but this time paired with George's clean lines and dream-like pastel palette of colours. The sweetest-looking ghost since Casper wants to wake up Lydia Lou to give her a scare, but even with the help of a series of noisy assistants he can't manage to make her. Ollie thoroughly enjoyed this one and has picked it out a few times already to read at bedtime, and to his little brother, picking out the words such as 'boo' which he can read himself. The repetition and rhyme of this type of book (familiar also to fans of Dr Zeuss) appeals to the natural way that children learn, giving them a sense of achievement because they can predict the direction the story is going in and start to join in with the repeated elements, but with the added gentle stimulation of each newly introduced element. Have you noticed that your little people will choose the same book or the same film over and over - this is why. Repetition is a hugely important facet of the way children learn and as such they are 'programmed' to seek it out. They can also become overwhelmed by sensory overload because their senses are so much more active than our own and their brains far more receptive to external stimulation. Demanding you play a game you are thoroughly bored with, or insisting on the same lunch every day for a fortnight is part of the way small children (and older children and adults with Autistic Spectrum Disorder) cope with all this sensory input. Along with the comfort zone activities, it is however important to introduce novel ideas and experiences to prevent them falling into lifelong ruts. The last book we were sent is certainly in a prime position to do this. Emily Gravett is the author/illustrator of one of both my boys favourite's 'Orange Pear Apple Bear', so I thought we knew what to expect. It could not have been more different. 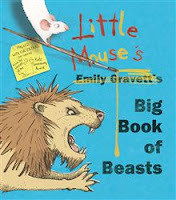 'Little Mouse's Big Book of Beasts' is like an artist's scrapbook, with torn-out, repasted and drawn over pages adapting what would have been a straightforward rhyming bestiary. Ollie was definitely outside his comfort zone and thought another child had 'ruined' the book. Over time he has come to be fascinated by the clever way the 'mouse' has changed the bestiary to it's liking, with it's funny commentary and interactive lift-the-flaps. I cannot remember another book where a newspaper is supplied on the page about wasps with which to splat one (Ollie's response - 'poor wasp, we do not hurt insects, that is not kind...'). His face in the picture at the top of the page says a great deal about his reaction - and that is the whole point of this clever book - he is reacting to it. He's challenged, he's uncomfortable, but he's discovering that stories can be more than a narrative and art can be all about surprise. I think we will be seeing a whole raft of new concepts coming into his own crafting and drawing as a result of this innovative book.